More Outreach: A Return to KIPP, Year Five – Patrick F. Clarkin, Ph.D. 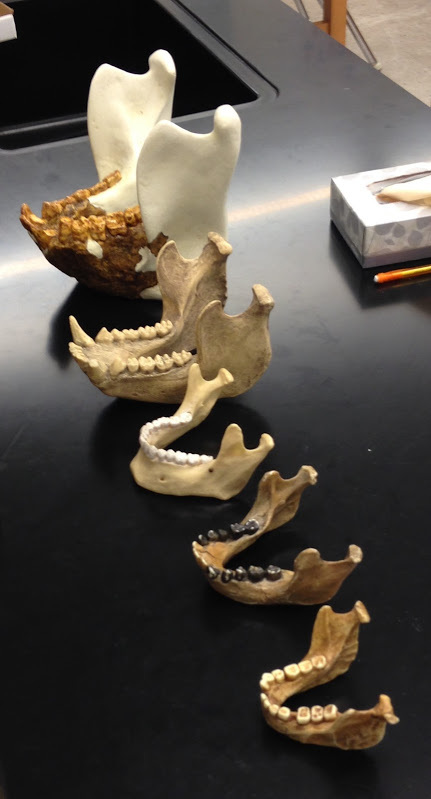 I brought some friends to show variation in the mandibles of some apes and hominins. This is the fifth (and likely final) year that I’ve visited the 8th graders at the KIPP school in Lynn, Massachusetts. Each Spring I visit for about three hours to talk about anthropology, evolution, and what life in college is like. This coincides with the time in the school year they are discussing evolution in their science classes. In my most recent visit last week, the theme of the day was how all living things are biologically related, though we focused mostly on humans and other primates. In a way, all humans are ‘cousins’, as is everything that lives. I also brought some fossil casts with me to enhance the presentation, including a new addition to our lab at UMass Boston — that of a Gigantopithecus. Of course, it was a big hit. Who can resist the concept of Gigantopithecus? When I started doing this, I asked around if any teachers in the area wanted me to come speak with their students. Only one teacher responded, and she kept inviting me back each year. This time she told me that she’s moving on to another position, so it will likely be my last year visiting KIPP unless something changes. I may have to find another way to share anthropology with middle schoolers. Each year, their teacher has them write me thank you notes. There are about 90 letters in total over three classes, and I read all of them to see what the students found most interesting. I love the effort they put into these, including the artwork and the enthusiasm they express for learning. This year, my favorites were a handful of letters that said they actually expected a talk about anthropology to be boring, but instead they found that it made them think about the world around them. That felt pretty good. Thinking, and a desire to learn more, are the goals. This entry was posted in anthropology, Outreach and tagged ALP, KIPP. Bookmark the permalink.